Our dartboard cabinet is a beautiful addition to any game room. 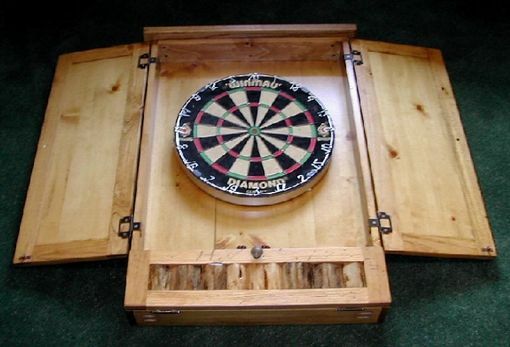 The cabinet is large enough to accommodate most of the traditional bristle dartboards or the newer electronic styles. 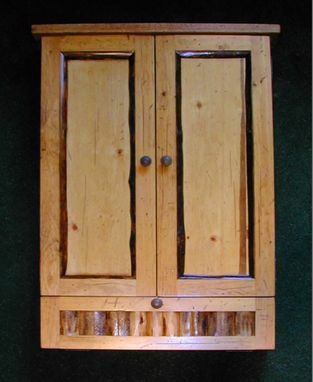 Inside, the cabinet features a cork backboard and score pads on the doors. The pull-down door hides a storage compartment for darts and accessories (darts & accessories not included). Shown in our Standard style, trimmed with quarter-round log insets to enhance the rectangular door panels, with half-logs on the bottom door. This cabinet is also available in the Gallatin style with dark trim boards inset in the bottom door area instead of the half-log trim shown.